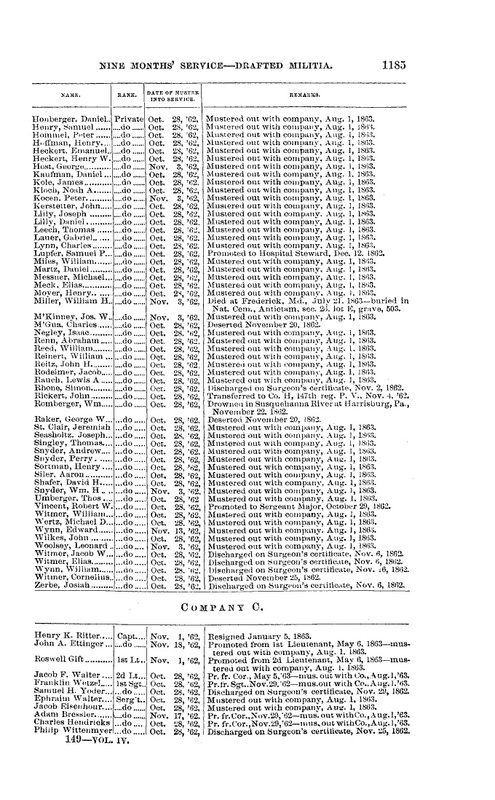 Applications for Civil War pensions by widows and children alike, lead the researcher to interesting facts about family and circumstances. Such is the sad tale of Private William Romberger, 172nd Pennsylvania Drafted Militia. The ongoing research into my Civil War past where I live vicariously through my ancestors, has taken me from one great great grandfather to another. This blog has acquainted the readers with my most documented ancestor, John W. Derr (48th Pennsylvania Volunteer Infantry) as well as my less documented ancestor, John Z. Wagner (6th & 55th Pennsylvania Volunteer Infantries). Further research lead me to another....William Romberger. 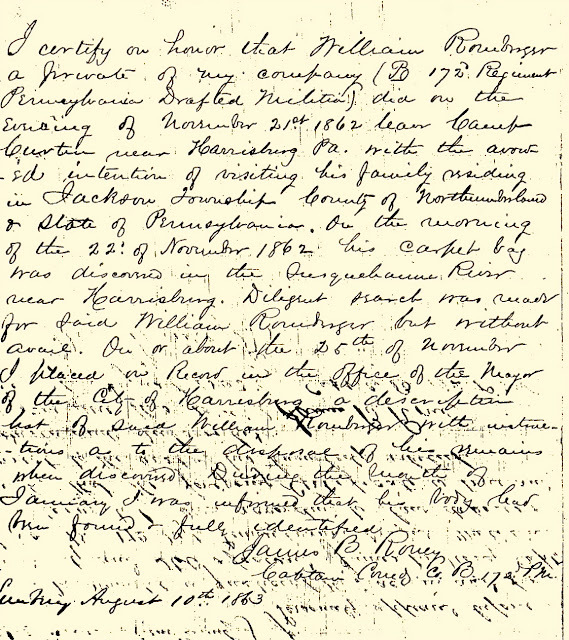 William Romberger was married to Sarah Klock on July 24, 1859. They had one child together, Franklin Lewis Romberger, who was born on October 18, 1860. Prior to his marriage to Sarah Klock, William was married to another woman, who's name and circumstances are lost to time. 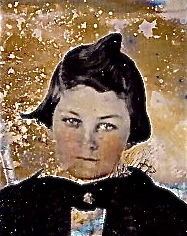 However, he had four children by that woman, one of which was Catherine Amanda Romberger...my great great grandmother. Catherine would eventually marry Charles Laudenschlager...a banker in the Klingerstown area of Pennsylvania. Catherine Amanda Romberger was born on July 17, 1854. So...this would make William Romberger my great great great grandfather. William, having been widowed from his first wife, was raising his children on his own prior to meeting and marrying Sarah. This part of the history line comes from oral history from my father, passed down from his mother...and so on. It is known that William, a common laborer, was very poor and had few resources from which to live and raise a family. After his marriage to Sarah, this situation did not improve. As a result William elected to become a "substitute" for another local man who was drafted into the 172nd Pennsylvania Drafted Militia. So in November of 1862, William signed the paperwork as a substitute for Isaac Albert, having more than likely received a bounty for his act. 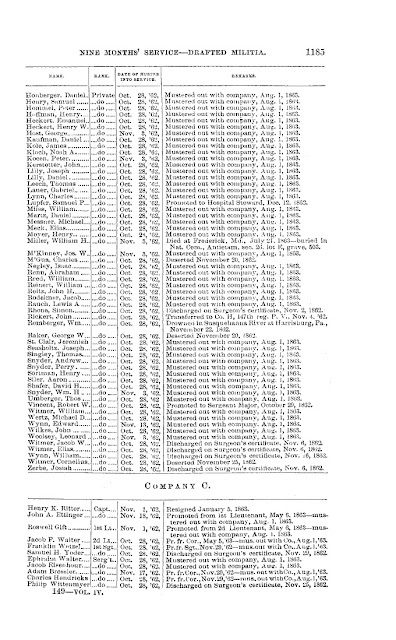 The 172nd Pennsylvania Drafted Militia., organized and moved to Camp Curtin in Harrisburg, Pa. to begin the normal training and outfitting done by Pennsylvania regiments during the war. It was on November 21, 1862, that William...having received a leave/pass, decided to travel the 65 miles northwest to Jackson township in Northumberland to visit relatives over a long weekend. On the morning of November 22, 1862, William's carpet bag (suit case of the day) was found floating in the Susquehanna River between Harrisburg and Dauphin township. A search for William was conducted by the army, but to no avail. 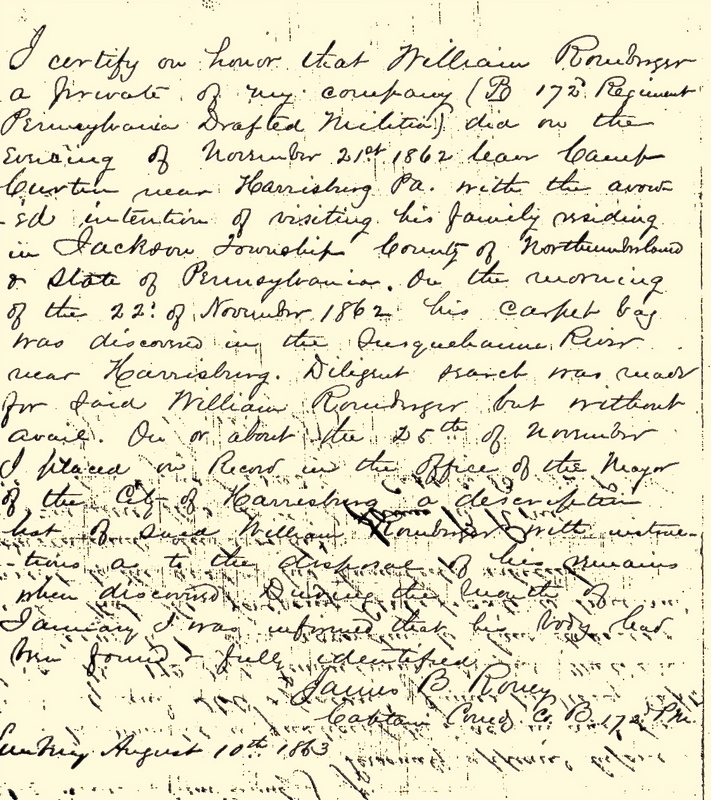 On November 25, 1862, Captain James Roney filed a missing persons notice with the City of Harrisburg on behalf of William Romberger. In January of 1863, the body of William Romberger was found, positively identified, and returned to his home. Later in 1863, William's wife, Sarah, applied for a pension for her dead husband. This request was denied by the War Department for the following reason: "Rejected. Soldier not in line of duty when drowned". The result was that Sarah, being destitute, parceled out her children to friends and family who could better care for them. Later, in 1882, after Sarah's death, the adult children filed a petition with the Pension Office, for a "Pension of Minor Children", to help recover monies lost during their childhood. This too was denied on the same grounds as the prior submission. The family never recovered the monies from the federal government. Eventually Catherine Amanda Romberger would marry Charles Laudenschlager. They would have a number of children, one of which was a little girl named Minnie...Minnie Laudenschlager. Minnie would one day marry a George Young. In 1910 they would have a daughter, Catherine...named for her grandmother Catherine Amanda. 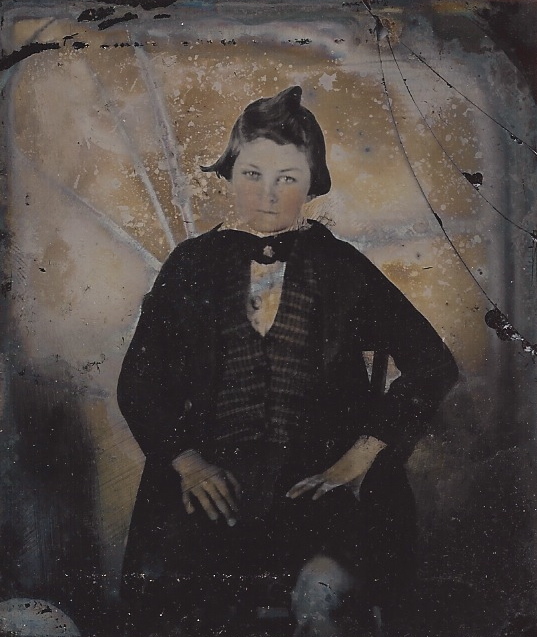 That little girl would eventually grow up to become my grandmother, Catherine Derr when she married my grandfather James Monroe Derr...the grandson of John W. Derr. Hence the tapestry woven for my family in the sad tale of William Romberger.